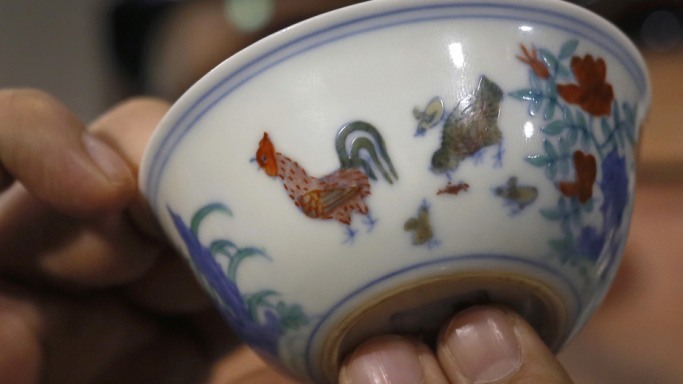 A very precious and rare cup originating from the famous Chinese Ming dynasty which was displayed at an auction in Hong Kong recently fetched a record breaking price of $36 million. Incidentally this is the highest amount fetched till date for any kind of porcelain item. The auction house Sotheby’s disclosed that wealthy Shanghai collector Liu Yiqian won the bidding for the prized cup which is also touted as the "holy grail" of China's art world. Forbes has reportedly estimated Liu’s fortune at a whopping$900 million, making him the 200th richest person in China. According to reports the dainty historical cup is also known as the “Chicken Cup”. The Ming cup was made during the late 15th Century. It is decorated with a beautiful painting of a rooster and hen tending to their chicks. Interestingly Sotheby’s has claimed that only 17 cups that were manufactured during the reign of the Ming Dynasty's Chenghua Emperor, who ruled from 1465 to 1487 have managed to survive till the present. However Sotheby's deputy chairman has admitted that the interesting piece does not features any legendary object in its history. This special auction as reports suggest in the media was closely monitored by the investors all over the world who tried to spot any signs of recovery in the volatile Chinese high-end art market following the recent fluctuating economic growth record of the Asian giant. Sotheby’s has claimed in their statement to the media that the previous record for Chinese porcelain was set in 2010 when a gourd shaped Qianlong vase was sold off for $32.4 million.